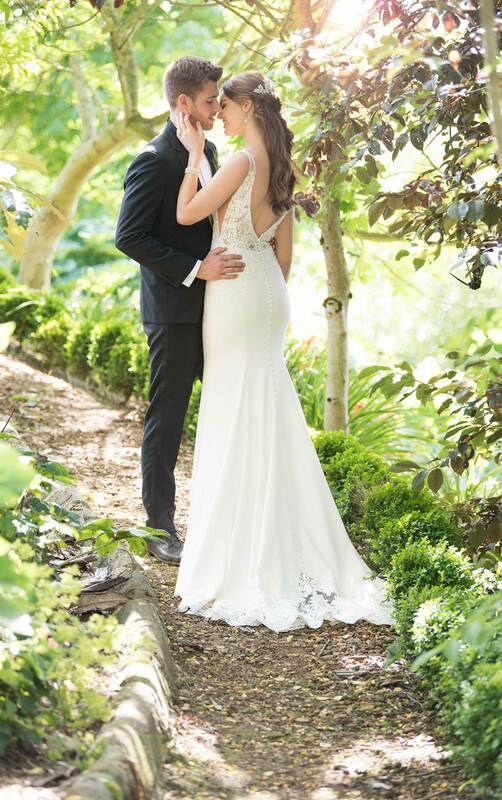 A simple silhouette with the perfect element of sexiness, this wedding gown from Essense of Australia has it all! A plunging V-neckline is the focal point of the front of this sheath silhouette and is accented with plunging side cutouts on either side. Graphic lace adorns the bodice, and extends down through the hips of the gown, helping to shape the body. Sheer straps extend from the bodice and extend to the back of the gown into a dramatic deep V-back, complete with sheer lace detailing. Laser-cut lace highlights the hem of the train and is enhanced with beading for an even more dramatic effect. The back of this simple wedding dress zips up beneath fabric-covered buttons.